Have back pain, this can help! Most back pain is associated with bad posture. The Lumbar Support Posture Corrector can help correct your posture to relieve that back pain!! It works for Men and Women!! The Lumbar Support Posture Corrector is an Adjustable Back Posture Corrector Clavicle Spine Back Shoulder Lumbar Brace Support Belt Posture Correction that Prevents Slouching. That translates to helping relieving that back pain that is associated with bad posture!! Makes a Great Gift for the Holidays!! Order it now and get it in time with just a 7 day delivery after processing(allow 2 days for processing)!! Available in Medium(28"-38") and Large (38"-48") in the color black. PRACTICAL--Posture brace filed with Lightweight neoprene?can be worn comfortably under or over clothing.Correct your posture all day.You can put on and adjust by yourself. Easily get perfect confident posture - start standing, sitting much straighter. Align your shoulders, spine and upper back. Improve posture & reduce slouching immediately with easily adjustable dual strap design. Lightweight padded neoprene corrector can be worn comfortably under or over clothing. 1. Do not bleach. Do not use Hot Water!! Use cold water hand washing. Let Hang Dry. Poor posture can be detrimental to health! If you are in front of a screen for gaming, work or just social media, chances are you suffer from slouching and poor posture. Even athletes can suffer from this due to muscle imbalances. 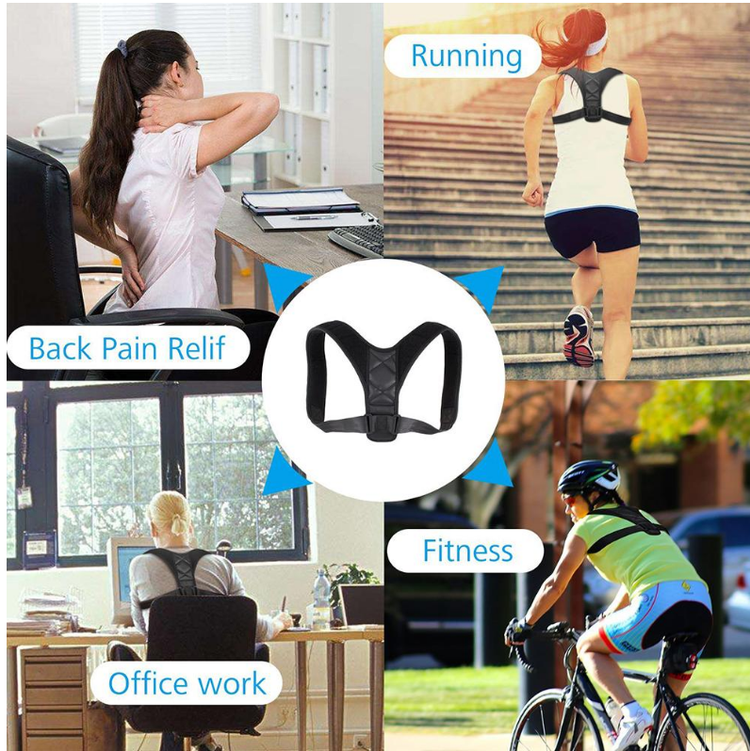 So whether you are male or female, athlete, gamer or spend long hours in front of a computer, our Lumbar Support Posture Corrector is a must. Lumbar Support Posture Corrector fits comfortably and is adjustable to all body types. It firmly pulls the shoulders back, eliminating the "rounding" of shoulders which cause unhealthy poor posture. Additionally, our Posture Corrector is amazing for helping athletes maintain proper back form while working out to also help prevent injuries. Look confident, feel confident and be healthier! WHY USE OUR LUMBAR SUPPORT POSTURE CORRECTOR? Lumbar Support Posture Corrector is not about a temporary fix. When your body adjusts to wearing our Posture Corrector, muscle memory will form so that even when taking it off, your body will naturally adjust to its newer and healthier posture. The lightweight but firm material is adjustable and made of breathable material which means you can wear it all day for maximum effect. Even under clothing! Answer: No! Our Lumbar Support Posture Corrector is an aid that helps your muscles maintain the correct posture, acting as a constant reminder to your and your muscles that keep your posture straight. Your muscles will develop over time to maintain it. Answer: No, unless you are wearing the Lumbar Support Posture Corrector incorrectly. If you experience pinching either you are wearing it too tight or you are slouching your shoulders into the posture corrector too much. Loosen the straps to your comfort level and pull those shoulders back! That's the beauty of the Lumbar Support Posture Corrector, if you are slouching, it will become uncomfortable, forcing you to keep your shoulders back to regain comfort. It is the perfect way to strengthen your muscles to develop longterm healthy posture. Answer: Our product is designed for 2 size that fits, Medium and Large. With specially designed stretchable materials and straps, it can be adjusted to all body types, men or women. Answer: First couple of days wear it for 10-20 minutes only, than add 10 minutes every day. Your back and shoulders will slowly adjust and you will build muscle memory for the right posture. Answer: Yes! The Lumbar Support Posture Corrector is designed to be sleek so that it fits under shirts or clothing, so you can wear it in public without people noticing. But for maximum comfort, consider wearing it over clothing. Question: How do I clean the Lumbar Support Posture Corrector? Answer: Do not bleach. Do not use Hot Water!! Use cold water hand washing. Let Hang Dry.